Bebo, will it shut down? 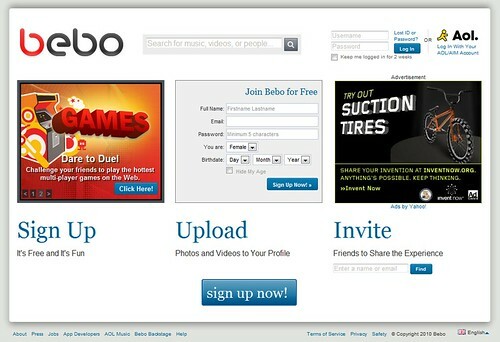 AOL are now beginning to see that the investment they made into the social network, Bebo, was a big mistake. So much now that they are either going to shut the site down or look for a new buyer, but it will be unlikely that they will make a profit if they sell it. Two years ago AOL bought Bebo for 850 million dollars! A lot of money, but back then Bebo was the number one social network in Ireland and the UK. Since then though it seems like Bebo remained pretty static, not a lot changed and it soon became more of a social network for young teens. Having such a younger audience does not always appeal to advertisers because they are less likely to make money from their advertisements. Other social networks such as Facebook suddenly took over in the past year and with a lot of people signing up to use Facebook they just lost interest in Bebo. I don’t use Bebo anymore, I might log in once every so often but I do not actually use it for talking to friends. Here is a little graph of recent stats for various social networking sites, you can see the decline in Bebo over the past year, almost a 50% drop in unique visits! I do think that it would be unfortunate to see bebo close, i think that with the right owner it could be turned around but it would require a lot of work. It should be more slimmed down, the content is just too bulky on the site, all other sites seem to be going with the trend of slimming down there sites. Facebook has a nice plain and simple look to it and so too does YouTube, with it’s recent upgrade of it’s video page it is even more simplistic! There is however always new and better services coming out and if the current sites do not keep with the times then they are bound to fizzle out like Bebo, when Twitter was launched, Facebook brought out a new, what’s on your mind feature, which is the same as what twitter has, by adding this feature Facebook managed to keep their members. Bebo did bring out a new feature like this but it was too late and also it didnt incorporate into the site as well as it did with Facebook. For Bebo to add that feature they had to make a new “Home” section to their site where you could see recent changes and the new status changes of users (the twitter-like feature). For now Bebo is still here, by the end of next month (May 2010) we will see if it will close down or be sold as that is when the company’s strategic evaluation will end.